The Football Shoe Bag is a full length zip-up shoe bag with a handle to help carry to the game. The Shoe Bag is in club colours and features a large full colour club crest on the front. The Shoe Bag is great a gift and ideal for storing your football boots, measuring approx 35 x 15 x 9cms. 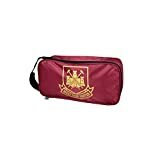 This Shoe Bag is an official Football product and is produced under licence for the respective Football Club.